Check all the options as on the screen below. Create a QC script : Will write the QC script on the disk. If you modifying the QC manually into a text editor you can uncheck that option. Compile MDL : will compile the QC scriptwhen the full compile button is activated, don’t forget to have steam opens. Click on GENERATE PATHS button and the paths are updated , if the fields are empty the model will not being exported. This path must always be “%GAME_PROJECT_SRC%/materialsrc/” when you click on “Generate Paths”. 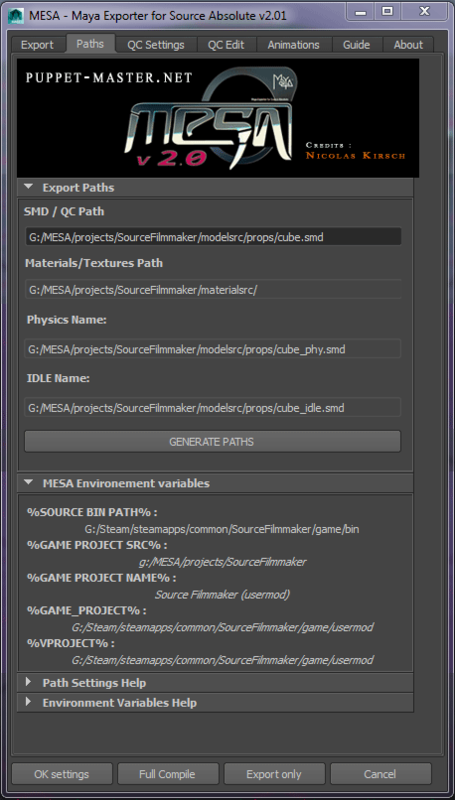 If the path does not ended by “/materialsrc/“, you probably have to Set the Maya Project workspace on the right project workspace ( %MESADIR% /projects/SourceFilmMaker/ for that tutorial). The section show the current paths set as environment variables on your system. 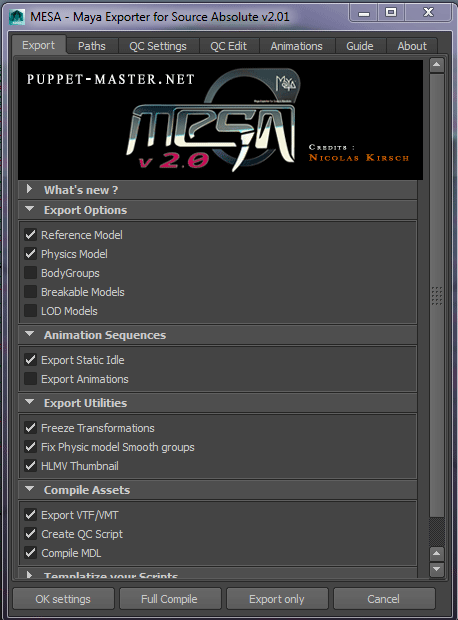 If you edit the environment variables , you must to restart Maya. If the “%GAME_PROJECT%” and “%VPROJECT%” are not identical , it can be caused by the Authoring tools launcher that is running in background and overide the %VPROJECT% variable path.